17 million Americans--approximately 6% of the population--have type 2 diabetes, the most common form of diabetes. Silver Book17 million Americans–approximately 6% of the population–have type 2 diabetes, the most common form of diabetes. 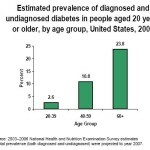 17 million Americans–approximately 6% of the population–have type 2 diabetes, the most common form of diabetes.